By now you’re one week into a long season, and Rachel Jones’ wisdom about Lenten persistence might be your best friend. If you need encouragement to put one Lenten foot in front of the other, here’s a list of resources and ideas. They are offered in hopes that they will help you live your Lent, all season long. Don’t try them all! Lent isn’t meant to be a season of overwhelm. Hopefully, just one or two of these will give you inspiration to go the distance. 1) From our Archives: Be intentional about the music you hear in this season. Years ago, when I was really into concert going and new artists, I decided to go on a “fast” from my usual musical diet. That Lent, I resolved to only listen to Christian music (or classical music) during my commute or in my apartment. Read more here. This post includes a great round-up of musical resources for faith formation. 2) Watch at least one good thing on YouTube. I made a Lenten video playlist a while ago for a youth event; you’re welcome to check it out here. 3) If you feel behind on Lent and out of ideas, try out a Lenten Family Practices calendar. This calendar has a simple faith activity for each day. The activities alternate through Prayer [P], Fasting [F], and Almsgiving/Service [S]. Prayer days have very simple prayers that can be used as conversation starters. Fasting activities are “mini” fast-like things that focus on giving something up. Service days have simple service suggestions for the whole family to participate in together. Simply purchase, download, and be inspired to act. 4) Maybe a family practices calendar is overwhelming, and you just want to do one thing. The “one thing per Lent” approach, over the many years you have children at home, builds upon itself. Vibrant Faith at Home suggests that Lent is the perfect time to teach a bedtime prayer to your children, or begin a practice of bedtime prayer with your families. 5) Take seriously the invitation to deepen your spiritual life. Remember, faith is caught more than it is taught. Seeing parents and grandparents take faith seriously is what young ones most need. Forward Movement’s Ashes and the Phoenix provides a path for your Lenten journey. 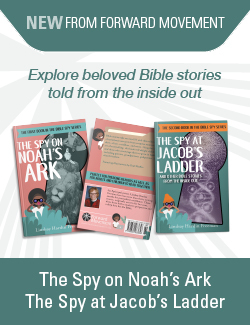 Learn more and order here. Or, check out more of their many resources for Lent! Just because you didn’t begin Lent with it doesn’t mean you can’t use it to make Lent more meaningful. Grandparents might like to have it just for the times their grandchildren are over. 7) If your family enjoys cooking together, making pretzels is a traditional Lenten activity. 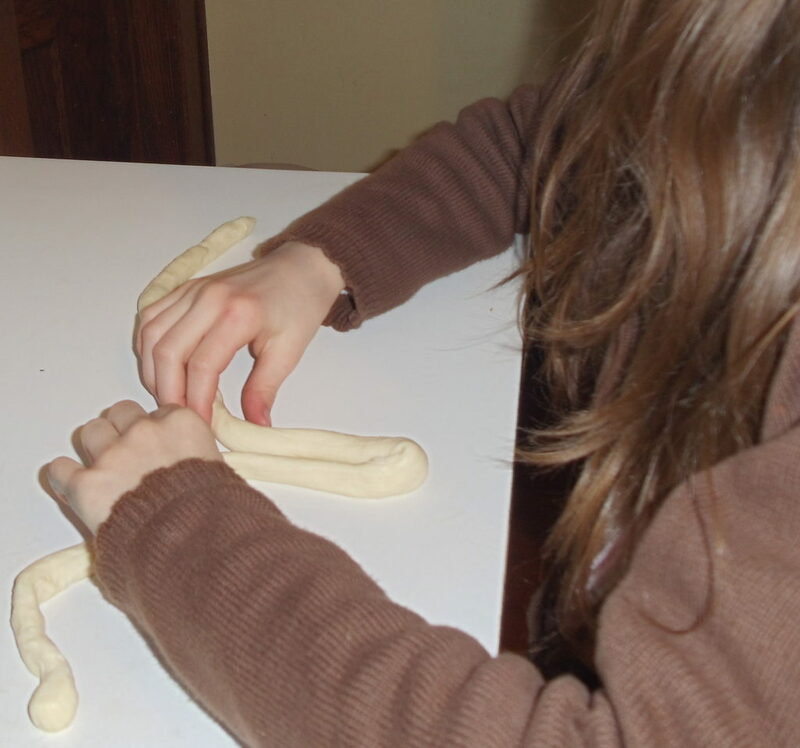 My daughter shaping pretzels in 2011 when I was wishing someone would start a faith at home blog for Episcopalians. Pretzels were developed as an option to satisfy abstinence and fasting laws of the time. Eggs, fat, and milk were forbidden during Lent. So, the remaining ingredients that one could use included water, flour, and salt. A young monk baked the first pretzel — making a Lenten bread of water, flour, and salt, forming the dough into the prayer position of the day, and baking it as soft bread. Read more (and find a recipe) here. And a bonus: And just in case six ideas aren’t enough, our cousins in the Roman Catholic tradition have provided a longer list of 40 ideas for a holy Lent. Plenty for everyone! May your season be observed as a remembrance of God’s grace. May it be, for you, a holy Lent. And remember, the whole point of grace is this: you can begin again. Does your family have Lenten traditions? What are they? One good thing to watch on youtube right now is Paul Schaffer and Bill Murray’s video Happy Street.